Following on from the success of our first eLearning course “The Beginner’s Guide to Toxicology” which has helped over 900 professionals gain confidence in understanding the adverse effects of chemicals on humans, Chemical Risk Manager is pleased to announce the launch of an eLearning course on ecotoxicology, “The Practical Guide to Ecotoxicology and the Environment”. Ecotoxicology is a multi-disciplinary science that studies the adverse effects of chemicals on all living organisms at the population, community and ecosystem levels. 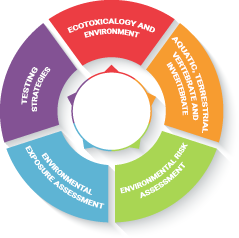 Ecotoxicological assessments are a standard information requirement for global chemical registration and notification procedures as well as for classification and labelling. This course provides you with the knowledge to recognise the ways in which chemicals may interact with the environment and the precautionary measures which are needed to prevent harm. This is achieved via a series of 15 modules filled with up-to-date regulatory data, using 340 professionally-designed pages of content combined with 420 audio explanations and 126 videos, module-specific quiz questions, an extensive glossary of terms and 15 module handouts. Built by the same team behind Chemical Watch’s first eLearning course “The Beginner’s Guide to Toxicology” which helped over 900 professionals gain confidence in understanding the adverse effects of chemicals on humans. Although a stand-alone course, this also works as a natural add-on training course to “The Beginner’s Guide to Toxicology”.